The EU paid illegal subsidies to aircraft giant Airbus, the World Trade Organization (WTO) has ruled, in the latest twist in a long-running dispute. The US lodged a complaint with the WTO six years ago, but the decision has only now been made public. Meanwhile the EU has made a similar complaint over the US's alleged support of its rival aircraft giant Boeing. The US called the WTO's decision "a landmark victory", though it is not clear if the EU will appeal. "Taking into account the nature of the prohibited subsidies we have found in this dispute, we recommend that the subsidising member... withdraw [them] without delay," the WTO said in its ruling. Ron Kirk, the US trade representative, welcomed the decision. "These subsidies have greatly harmed the United States, including causing Boeing to lose sales and market share," he said. "Today's ruling helps level the competitive playing field with Airbus." European governments were found to have unfairly financed Airbus through risk-free loans, and research and infrastructure funding. But the WTO did not uphold all of the US complaints. European support for Airbus was not found to have affected jobs or profits in the US aircraft industry, the report said, rejecting the US claim that state support had materially impacted the sector. 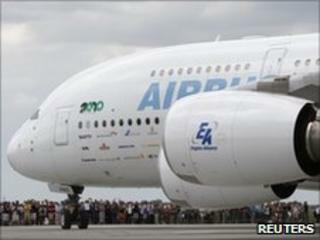 And Airbus said that the support system itself - based on loans repaid as planes are sold - had not been faulted. The European Commission said it would decide whether to appeal the ruling. It has 60 days to do so. That may prolong the dispute, which began in 2004, even further. The WTO is also expected to rule on whether the US illegally supported Boeing in a similar way next month. "Only then will we have a fuller and more balanced picture of this dispute," said EU Trade Commissioner Karel De Gucht. "The EU remains committed to a negotiated outcome to the dispute with no pre-conditions on either side."